I believe it was early last year when a video of people cooking instant noodles and enjoying them by the Han River in Korea went viral. 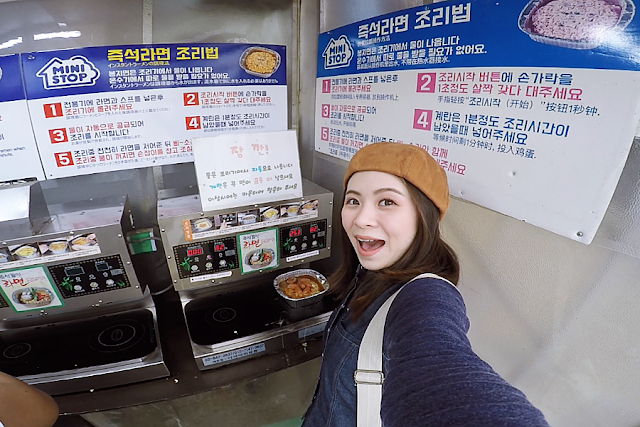 It was a super cool concept and I told myself if I had the chance to go around Seoul myself, experiencing ramyeon at Han River will definitely be on top of my list. Many months later, Dex and I had a trip to Seoul and did this together. While planning this trip, I was so focused on trying to find which Han River that has this special cooking machine. I thought it was only one particular place sell this but it's actually not. I believe by now, pretty much any park that's by the Han River allows you to have this experience as long as they have a convenient store. We've chosen to visit Yeouido Park by the Han River since it was one of the recommended place that my sis-in-law mentioned and she's not wrong, the park was beautiful. I personally do recommend this park too. Upon arrival, the first thing you'll have to do is to find a convenient shop. 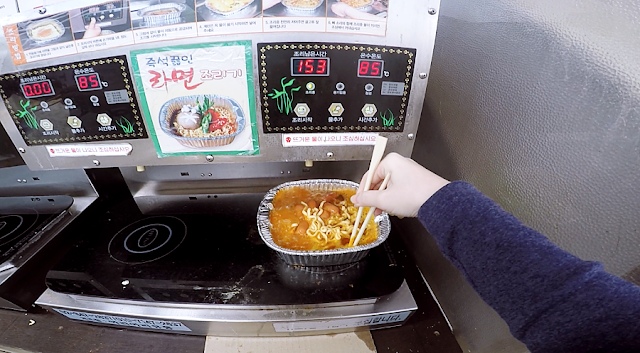 Most of the time, you'll probably already notice people cooking their noodles outside with the machine. You'll then know that the convenient store provides such service. What we did was we try to get a table outside first and then went into the store to select our ingredients. We bought 3 different type of noodles that we have no idea what flavours are they, mini sausages, cheeses for my husband, and kimchi. The packed kimchi was pretty good, I was pleasantly surprised. In the store, go directly to the noodles that already have a disposable bowl that's made out of either paper or aluminium. They have a slightly different charge as compared to just the noodle package. 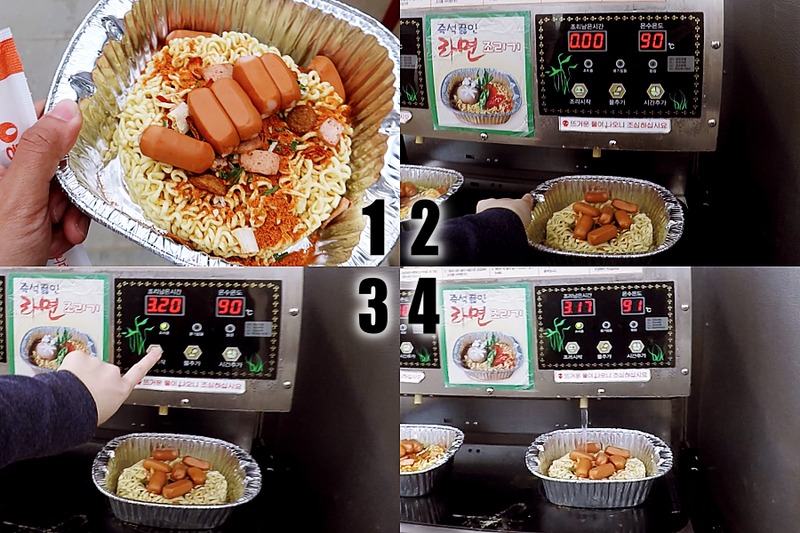 They are around 3500-4000won each noodle set. Pour everything out into the bowl and add sausages or kimchi if you want. Don't put in your egg or cheese yet if you have them. Bring them to the machine and place them at the designated area. Press the button on the Left most to start. Don't need to bother with other buttons. The top left number displayed is the timing left and the top right indicates the temperature. Water will dispense from the machine and just let it sit there and do its thing. The machine will know how to dispense just the right amount of water, so don't worry. After a while it will start boiling, you can use your chopstick to stir the noodles around if you like. Maybe a minute before it's done, you can crack in your egg if you have them. Sometimes, they have cardboards prepared for you to use as a tray since the bowl might be hot after it's done cooking. Please use them and return it back after using it. Finally, add in extra kimchi or cheese just before you eat if you'd like. 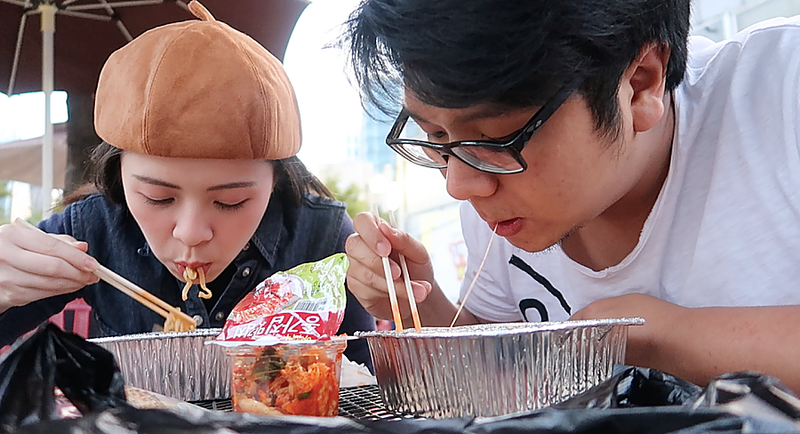 Having ramyeon by the Han River is definitely one of best experience we've had when in Seoul. Especially during those colder months, it's so nice to sit out, have a simple hot meal paired with beer, people watch, and enjoy each other's company. Seriously, so much win. We loved the whole concept of it and thoroughly enjoyed the entire experience. 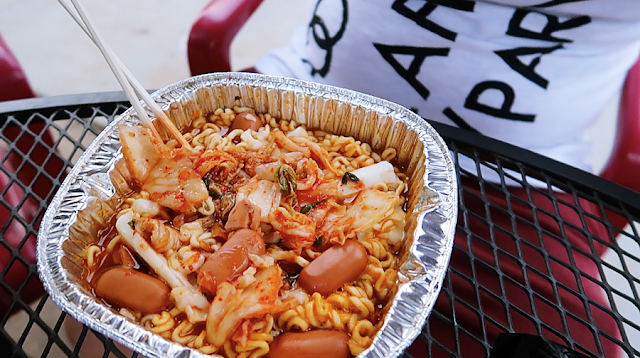 Check out our vlog for more visuals of enjoying instant noodles by the Han River! Do like this video and subscribe to TehChamLee's Channel!